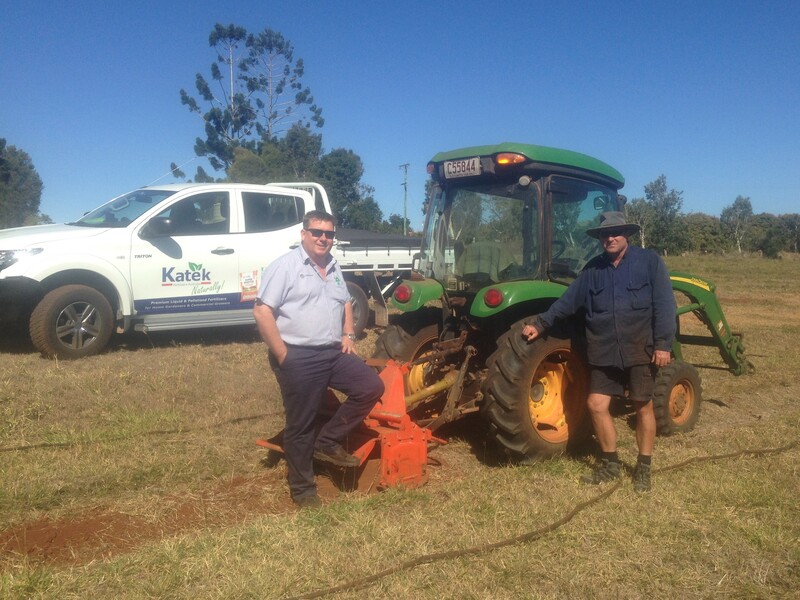 Childers Farm success with Katek Customised Blend! Andrew Haaksma farms on a patch of contoured red soil just on the northern outskirts of Childers. He grows a variety of crops from zucchinis to passionfruit to snow peas. Previous generations of Andrew`s family, (Using the accepted practices of the day) have left Andrew with a bit of a job to get parts of his farm back into good enough shape to make farming viable again. Enter Jules Keller, Lindsay Rural agronomist based in Childers. “I spoke to Andrew, and we agreed that something wasn`t quite right so we decided to get a soil test done and that way we could start with the facts”. The soil sample revealed that there were some soil amendments required, and a few nutritional gaps as well. “We were looking for something more than a normal fertiliser. We needed organic material and some NPK nutrients in a bit of a strange combination. Previous experience told me that putting products like that together was one of the things that Katek were very good at”. The resulting product meant that Andrew could get exactly what his soil needed, and he could do it in a single application, saving him time and money. “Having everything I needed in a single product made things, so quick and easy. The fertiliser went on really well, and the production results were outstanding”. The interesting thing about this wasn`t just that there were a mountain of snow peas, but, ”The other thing I did notice was that throughout the crop I spent much less time and money on spraying Fungicides and insecticides, there was just no need to”, Andrew stated. Jules explains “While I can`t say for certain that the fertiliser was responsible, we do know that healthy plants suffer less from outside attacks from things like pests and disease”. suit your soil and crop needs! and discuss the many blend options available!